An animal bite can break, puncture, or tear the skin. Animal bites that break the skin put you at risk for infections. Most animal bites come from pets. Dog bites are common and most often happen to children. Compared with adults, children are much more likely to be bitten on the face, head, or neck. Cat bites are less common but have a higher risk for infection. Cat teeth are longer and sharper, which can cause deeper puncture wounds. Most other animal bites are caused by stray or wild animals, such as skunks, raccoons, foxes, and bats. 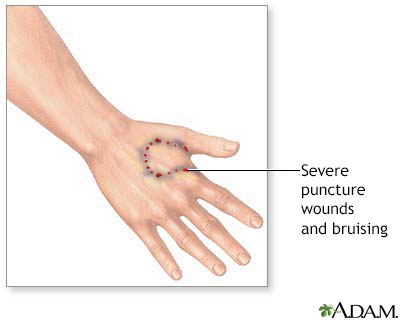 Bites that cause a puncture wound are more likely to become infected. Some animals are infected with a virus that can cause rabies. Rabies is rare but can be deadly. Rabies is a deadly viral infection that is mainly spread by infected animals. Wash your hands thoroughly with soap and water before treating the wound. If the wound is bleeding, put on latex gloves if you have them. Wash your hands again afterward. Stop the wound from bleeding by applying direct pressure with a clean, dry cloth. Wash the wound. Use mild soap and warm, running water. Rinse the bite for 3 to 5 minutes. Apply an antibacterial ointment to the wound. This may help reduce the risk for infection. Put on a sterile bandage. If the bite is on the neck, head, face, hand, fingers, or feet, call your provider right away. For deeper wounds, you may need stitches. The provider may give you a tetanus shot if you have not had one in the last 5 years. You may also need to take antibiotics. If the infection has spread, you may receive antibiotics through a vein (IV). Tell them what the animal looks like and where it is. They will decide whether the animal needs to be captured and isolated. Getting a rabies shot right after you are bitten can protect you from the disease. Teach children not to approach strange animals. DO NOT provoke or tease animals. DO NOT go near an animal that is acting strangely or aggressively. It may have rabies. DO NOT try to catch the animal yourself. Wild animals and unknown pets could be carrying rabies. If you have been bitten by a wild or stray animal, contact your provider right away. See your provider within 24 hours for any bite that breaks the skin. There is swelling, redness, or pus draining from the wound. The bite is on the head, face, neck, hands, or feet. You see exposed muscle or bone. You are not sure if the wound needs stitches. The bleeding does not stop after a few minutes. For serious bleeding, call your local emergency number, such as 911. You have not had a tetanus shot in 5 years. Eilbert WP. Mammalian bites. In: Walls RM, Hockberger RS, Gausche-Hill M, eds. Rosen's Emergency Medicine: Concepts and Clinical Practice. 9th ed. Philadelphia, PA: Elsevier; 2018:chap 54. Goldstein EJC, Abrahamian FM. Bites. In: Bennett JE, Dolin R, Blaser MJ, eds. Mandell, Douglas, and Bennett's Principles and Practice of Infectious Diseases, Updated Edition. 8th ed. Philadelphia, PA: Elsevier Saunders; 2015:chap 320. An animal bite may not appear to be life-threatening, but if left untreated the bite can lead to a serious infection. 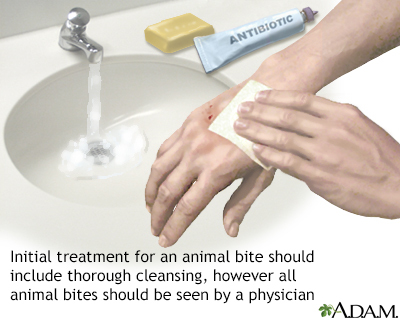 An animal bite should be cleaned properly, and the wound should be observed for any sign of infection. Animal bites are injuries that result when flesh is torn between the teeth of an animal. First aid for a bite includes washing minor wounds, applying pressure and dressing with a clean cloth until bleeding subsides. If the animal is wild or domestic but not vaccinated there may be a concern about rabies. When possible the animal must be quarantined or autopsied to determine if it is rabid. A physician will make the decision about rabies prophylaxis.